See all the sights of the city in Paris' first roller marathon! If you’re a skating fan and communities like Pari Roller, you’ll surely want to know about this. 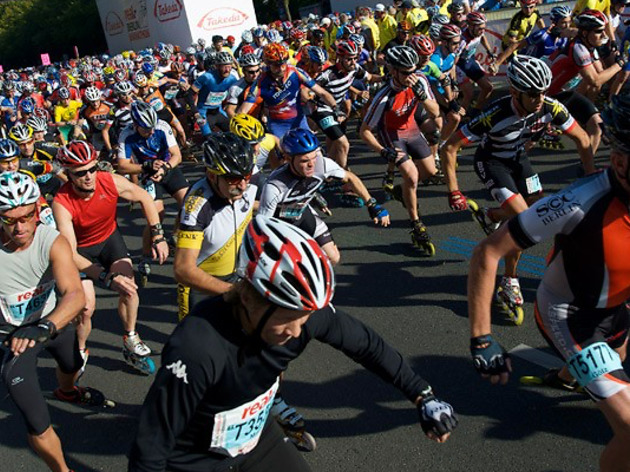 On October 15, Paris is hosting its first rollerblading marathon in conjunction with Virgin Radio. See the most beautiful city in the world on skates, and zoom past attractions like the Arc de Triomphe and the Champs Elysées, Eiffel Tower, The Louvre, Moulin Rouge and more. For its first edition on October 15 at 2.30pm the Virgin Radio Paris Rollers Marathon will start from and returns to the Eiffel Tower. The route traces the Seine throughout the city in two laps of 21 kilometers for a breathtaking view of Paris. You can do the race in two ways, take on the 42.195 kilometres yourself or split it into a relay as a pair. While the race is open to everyone, given the length and speed of the event it’s probably handy if you’re a bit agile on wheels. There’s still places left for individual and duo categories, and if you book before September 17 there’s a reduced price. If you’re a blading nut don’t let this great event speed away without you!